This bunny is just beautiful. I'm sure he is newer but is made to look old. It has an antiqued look with all over deliberate crazing over the decoration. 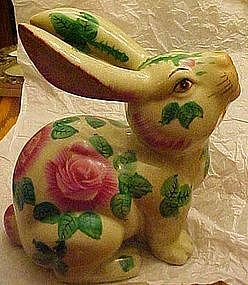 Beautiful pink roses and leaves all over the rabbit. I guess you could call it a large chintz pattern. He is made of a nicely glazed porcelain, and measures 9" tall. Pristine condition.